Today I'm squeezing in one last tutorial to inspire you guys to enter the Sally Hansen I Heart Nail Art competition before it ends this month! The theme is texture and I'm really excited to share this manicure with you because anyone can do it. 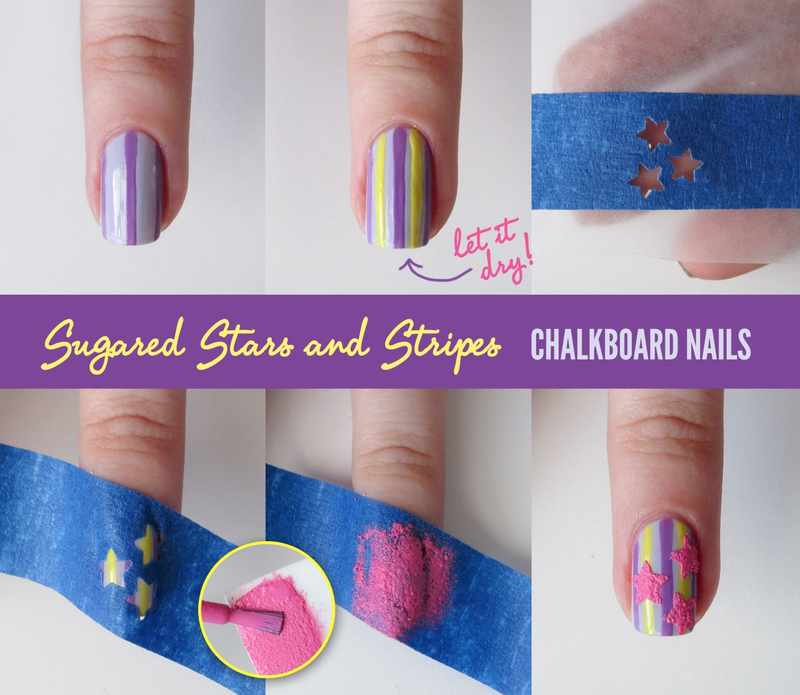 You'll need some polishes, a few tools, and some patience... and you'll be rocking this candy-sweet stars and stripes manicure in no time! The amount of supplies may seem intimidating, but I promise this'll be easy once we break it down! Watch me do this manicure LIVE through the magic of YouTube! I've also got you photo tutorial gals covered. 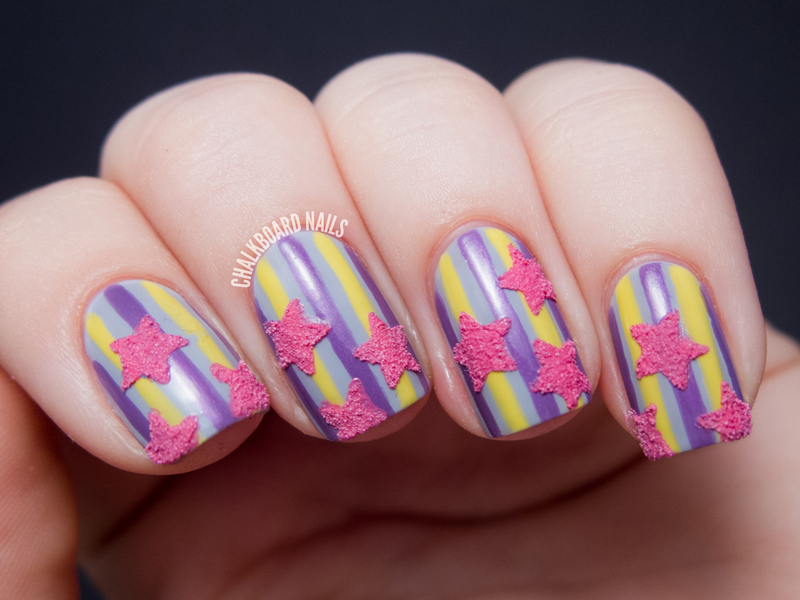 Using your nail art brush, paint three stripes with Violet Voltage onto a base of I Lilac You. Leave space between the stripes for your second color. Fill in the spaces between your dark purple stripes with Mellow Yellow. If needed, go over the stripes until they are the desired opacity. (2b.) Topcoat! Since we will not be topcoating the textured stars, you need to seal in your stripes now. Wait for your manicure to dry completely before moving on to step 3. Stick a piece of painters tape on to wax paper for ease in hole-punching. Punch three stars, leaving a little bit of room between them. Slowly peel the tape off and stick it to your nail. Push down hard around the stars' edges to prevent polish from seeping underneath. Paint Cotton Candies textured polish onto a makeup wedge. 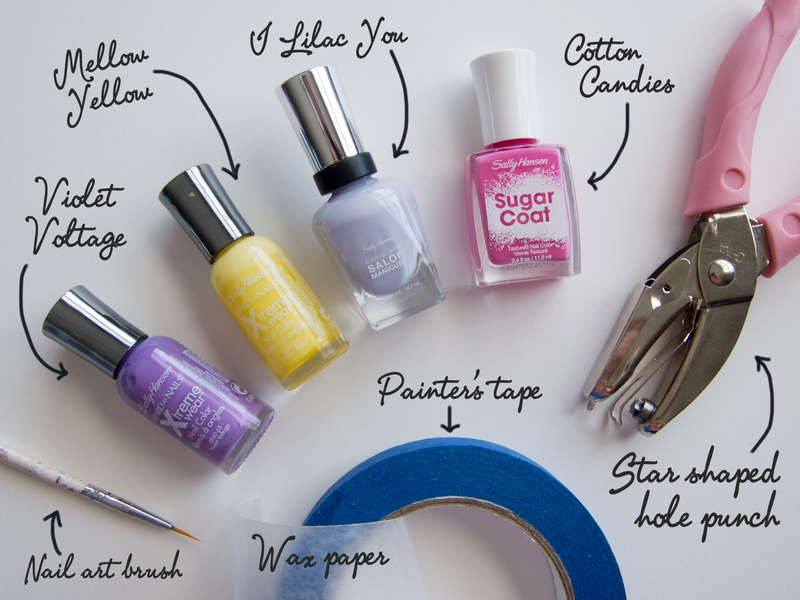 Tap the sponge lightly over the tape to transfer the polish to the nail. Repeat once for extra texture. Slowly and carefully remove the tape from your nail. Give your design a few extra moments to set since the Sugar Coat polishes aren't meant to be topcoated. Don't forget that this is the last month to enter into the I Heart Nail Art competition for a chance to win $500, a trip to NYC, and a shot at the $2,000 grand prize! Sally Hansen products can be found at chain drug stores, food stores and mass retailers nationally. Visit their Facebook, Twitter, and Instagram for more information. This is cute, All I need is a hole punch now! 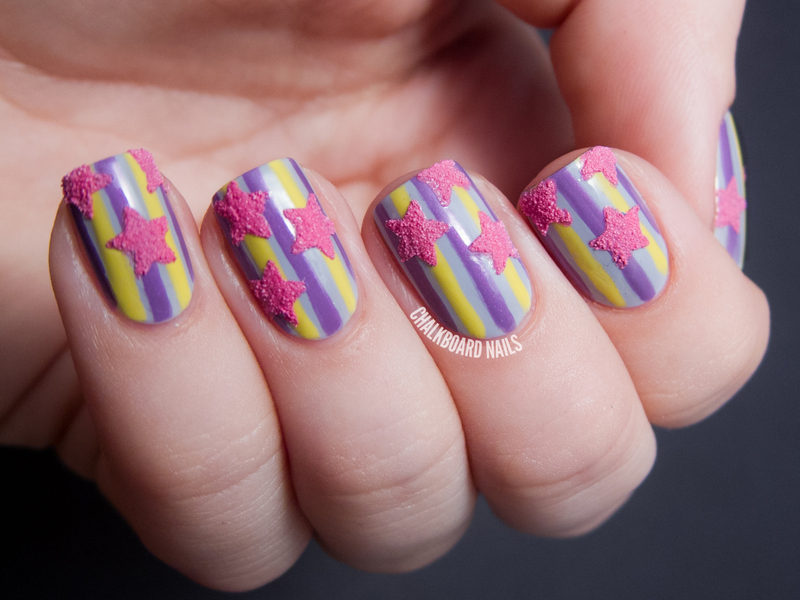 I am going to have to try this cute mani. I hope JoAnn's fabrics carries them as it's right down the street. I just picked up the Sugar Coat polish in Bubble Plum yesterday. I also picked up a new one with shimmer!!!! Oh yes, a Sally Hansen Sugar Coat called Royal Icing and it has glittery shimmery sparkle. Oh and others too, a dark pink one called Pink Sprinkle with shimmers. and they had more!!! I hope these aren't limited edition as I only grabbed a couple. I LOVE this! Thanks for sharing the tutorial as well :) I need to try this! I love how easily this can translate into a fun 4th of July look for us US girls this summer! This is lovely, amazing!! !thanks for the tutorial!!! this is so stinking cute! i never know what to do with my texture polishes after i swatch them. 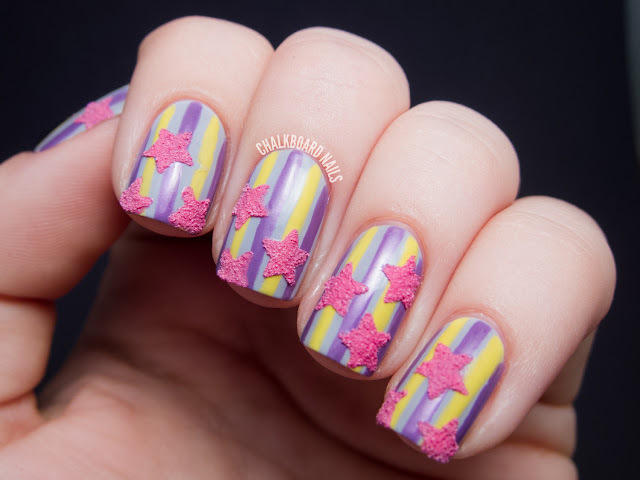 i never thought do to nail art! love it!! The puncher is from Michael's craft store! One thing intrigued me - sponging the polish on. Is this something to help the textured polish look right, or would you suggest it for any using-tape-for-a-design manicure? Thanks! It depends on the type of manicure you are using the tape for, I think. In this case, the sponging makes more sense because it just applies the textured polish better and more evenly without letting it seep under the tape. If you need to be more precise in your tape manicure, painting it might be a better choice. Wowza this looks awesome!! Great tips with the wax paper/hole punch/painter's tape! I'd love to see this in red, white, and blue for the 4th of July! I'm going to need to try this! This is pretty awesome sauce. Thank you for replying :) that makes sense! I LOVE these! Super cute idea! Such a cute look! I love the textured stars :). Choose always best nails spa for caring your manicure and pedicure, because some chemical may be harmful. Anyone know where you can buy shaped hole punches in the UK. I all the ones I have found have been a little too big. I'm curious as to why you sponged the sugar coat on rather than using the brush application method. Easier? Less messy? More control? I'm thinking of trying a similar look once I get a star shaped hole punch, that's why I ask. Hi! You could definitely paint the polish on, but I find the sponge worked best for me because it concentrates the texture better. It also applies more evenly, and I think it helps prevent the polish from seeping underneath better. Give it a try with the brush though if you'd like!